Expect to be intrigued as you hear Tony Kalinowski concisely tell his personal story of his lifechanging spiritual journey. And though Tony is a leader in his profession as the head of a financial planning firm in St. Louis, it has little to do with his profession. But the result? Personal satisfaction, fulfillment, and, yes, great joy and meaning in life! Tony is again the emcee to the annual “Prayer Breakfast for Greater St. Louis,” and he invites us to join him in this highlight of the year event. In 2019, it happens on Wednesday, April 17, 7:30 – 9:00 AM in the America’s Center. Many hundreds attend. For tickets on this 42nd one, visit www.cbmcstl.com. The inspirational guest speaker is always a layman … like most who attend … who has been through much, often bruised, but has come through wiser for the experience, with a great story to tell. And the 2019 Breakfast is no exception. 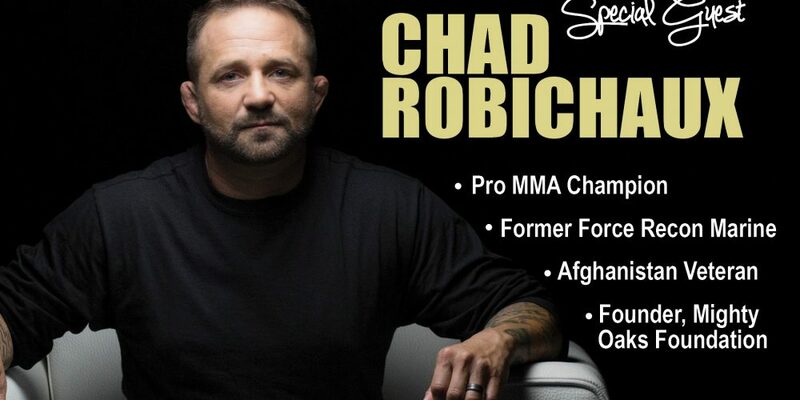 It features Chad Robichaux, who’s background includes being a pro MMA Champion, a former Force Recon Marine, a veteran of Afghanistan, and founder of the Mighty Oaks Foundation. The foundation has helped … and is helping … hundreds of veterans – many of them suicidal — come through PTSD and other wounds of war. Their eventual success would serve as a pattern to help hundreds of others. Together, they founded and lead the Mighty Oaks Foundation and have seen more than 800 veterans plagued by the wounds of war graduate, some of whom would have committed suicide. A helpful and inspiring 5-mimute video of Kathy and Chad Robichaux can be easily assessed at …https://www.mightyoaksprograms.org/. Another important video where the couple talks of their shattered marriage … and its restoration … is available by clicking on … .http://www1.cbn.com/video/couple-helps-restore-veterans-and-families-struggling-with-ptsd. Their book is available at http://www1.cbn.com/books/marriage-advance. Again, more is found at their website … www.mightyoakswarriorprograms.org. To hear … “Basketball great Steve Stipanovich tells his surprising story at the Congressional Prayer Breakfast” … click on … http://haroldhendrick.com/2014/04/13/basketball-great-steve-stipanovich-tells-his-surprising-story-at-the-congressional-prayer-breakfast/ ; and ..
To hear … Gary Tedrick: Cong Breakfast hosts FBI “whistleblower” Mark Whitacre; Matt Damon played him in movie” … click on … http://haroldhendrick.com/2016/04/15/gary-tedrick-cong-breakfast-hosts-fbi-whistleblower-mark-whitacre-matt-damon-played-him-in-movie/.